Shared-lane stencils for bikes, a.k.a. “sharrows,” definitely have their place in a balanced and healthy street system. But these friendly reminders to drivers to share the road have their limits as a tool to boost safety and create more inviting streets for biking. A study by the LA County Bicycle Coalition [PDF] showed that sharrows do little or nothing to encourage new people to take up cycling, the way bike lanes and cycle tracks do. 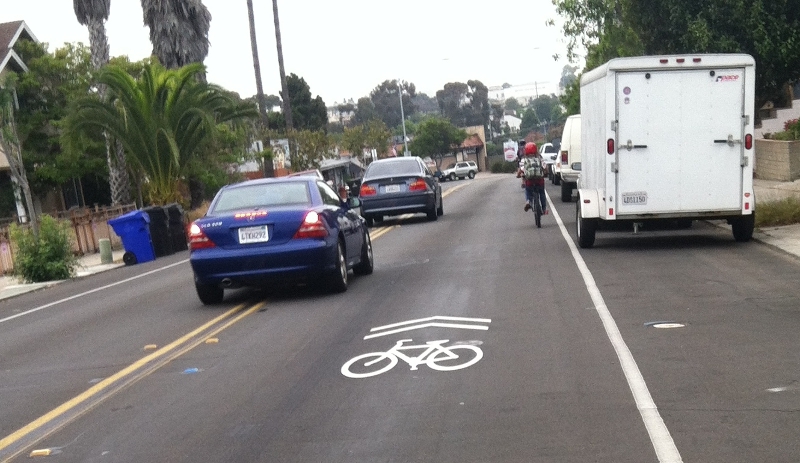 In the last year, San Diegans have seen the increasing number of shared-lane markings, also called “sharrows.” Sharrows are appearing everywhere: Adams Avenue, Park Boulevard, Broadway, El Cajon Boulevard, Grand Avenue, Voltaire Street, Chatsworth Boulevard, Hotel Circle South, Pacific Highway and more. However, these sharrows are being used as a cheap band-aid instead of implementing real change on our roadways that would increase the number of people riding their bicycle for transportation or recreation. Elsewhere on the Network today: The Urbanophile asserts that Chicago is on the wrong track by aspiring to be a “global city,” and offers some ideas to turn things around. American Dirt talks about how street art, or public murals, can make cities more inviting. And the Transportationist shares a study finding that pedestrians are injured less frequently at unmarked crosswalks because they act more cautiously around traffic.